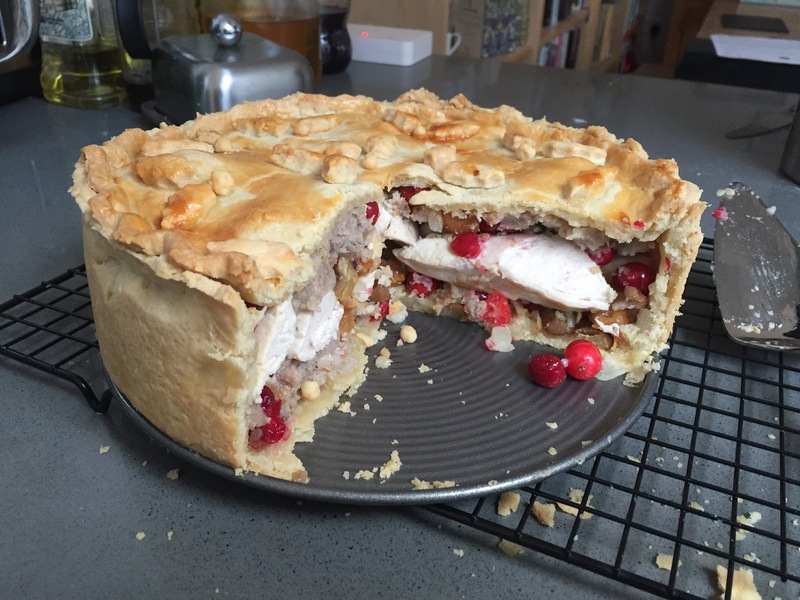 I wanted to carry on with my pastry practice over Christmas so found this rather epic Christmas pie on the Goodfood website. 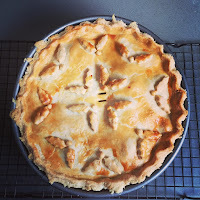 I'd not used a spring form tin for pastry before, but it came out really well and I'll definitely try it again. 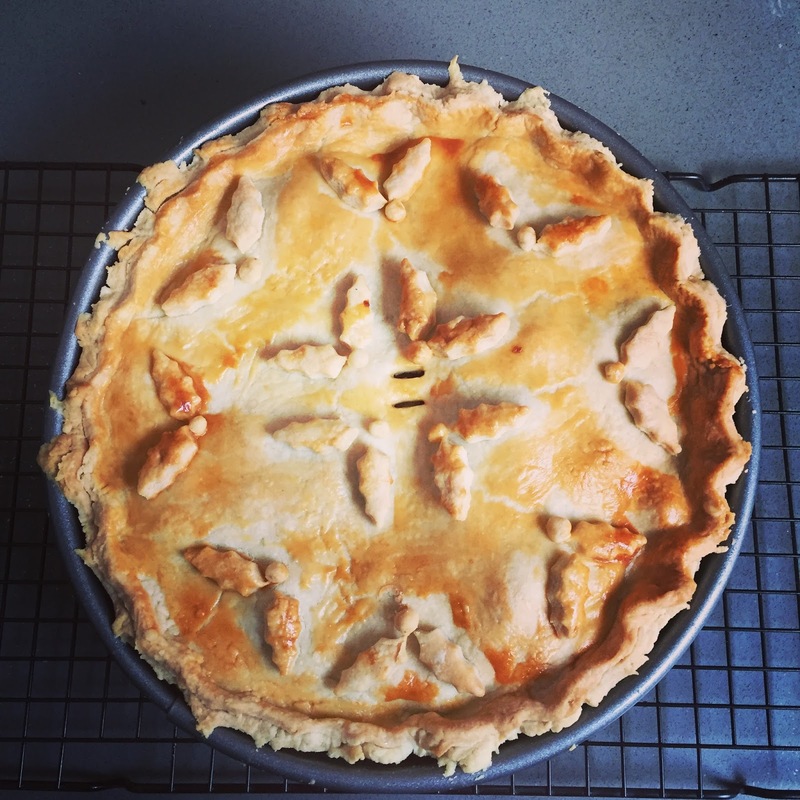 I did deviate from the recipe by making the pastry from scratch rather than pre made. One thing I did mess up was measuring the ingredients for the pastry, I convinced myself that the ration of flour to fat was 1:1 instead of 2 flour:1 fat. Oops! I had to start again with the first batch of pastry, but got it right second time, and it's not a mistake I will make again! Make the pastry by rubbing the butter into the flour either by hand or with a food processor or a stand mixer, until it resembles breadcrumbs. Sprinkle about 3 tbsp of iced water over the mixture and stir in using a knife. Bring the mixture together with your hands to form a smooth paste. If the mixture does not come together add a little more water. Form the pastry into a disc and wrap in clingfilm and rest for 30 mins. Whilst the pastry rests make the filling. Heat oven to 190c/170fan/gas 5. Heat the oil and butter in a frying pan, then add the onion and fry for 5 mins until softened, Cool slightly. Tip the sausagemeat, lemon zest, breadcrumbs, apricots, chestnuts and thyme into a bowl. 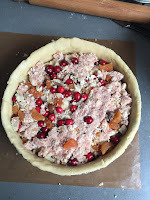 Add the onion and cranberries and mix everything together with your hands, adding plenty of pepper and a little salt. Cut each chicken breast into three fillets lengthwise and season all over with salt and pepper. Heat the remaining oil in the frying pan and fry the chicken fillets until browned, about 6-8mins. 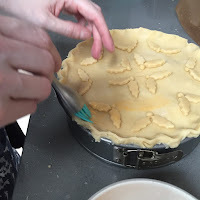 Roll out the thirds of the pastry to line a 20-23cm springform tin. Press in half the sausage mix and spread to level. Then add the chicken pieces in one layer and cover with the rest of the sausage mix. Press down lightly. Roll out the remaining pastry. Brush the edges of the pastry with beaten egg and cover with the pastry lid. Pinch the edges to seal, then trim. Brush the top of the pie with the egg, then reroll the trimmings to make holly leaf shape and berries. 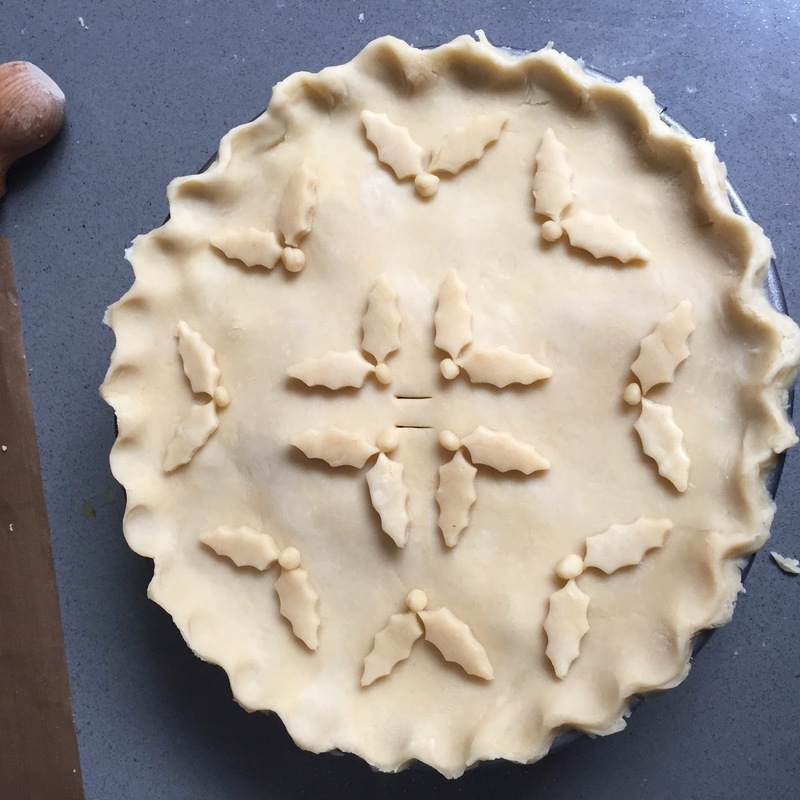 Decorate the pie and brush again with egg. Set the tin on a baking sheet and bake for 50-60mins, then cool in the tin for 15 mins. Remove the tin and leave to cool completely. 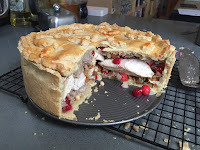 This is a really good pie recipe that really hits all the Christmassy flavours without being too overpowering. 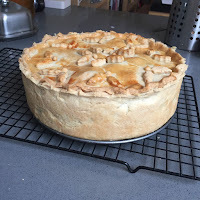 I'll definitely be making it again and trying other epic pies!